After a season of exciting battles and events all over Europe, the Visma Ski Classics Season IX came to an end above the Artic Circle. Ylläs-Levi in the north of Finland was the season finale and it gave everyone a thrilling season ending. Astrid Øyre Slind, Team Koteng, did a copy paste of last year’s event. With a final push 9 km before the finish line she skied away from her competitors to a second Ylläs-Levi victory in a row. -Last year I broke away in a downhill, this year I had to do it in an uphill. I’m super happy with this victory and it’s a really good end of the season, says Astrid Øyre Slind. In the men’s race everyone expected anyone but Andreas Nygaard, Team Ragde Eiendom, to break away at the end. But Andreas was stronger than ever and with a decisive move 12 km to go, he left everyone behind. -Finally a solo victory and the best possible way to end the season, says Andreas Nygaard. 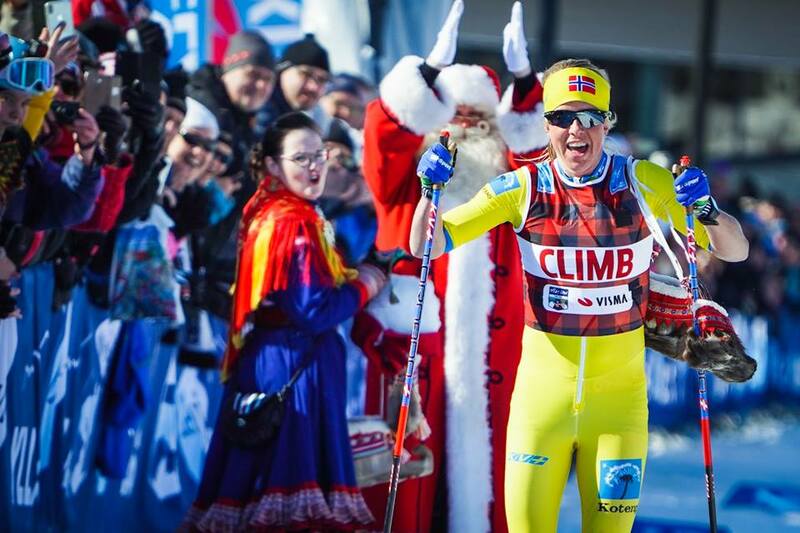 After 12 events during the season, Ylläs-Levi also put an end to all bib competitions in Visma Ski Classics. With his victory today, Andreas Nygaard secured his first place both in the Hertz Champion bib and the Visma Nordic Trophy competitions. Britta Johansson Norgren, Lager 157 Ski Team, had already secured her victory in the Hertz Champion bib competition and saw herself beaten by Astrid Øyre Slind, Team Koteng, in Visma Nordic Trophy. The standing in the climb bib competition was all open before today’s race and we witnessed a thrilling end in both the men’s and women’s category. Morten Eide Pedersen, Team BN Bank, attacked 100 meters before the climb point at Kukastunturi and with a clear sprint finish victory he gathered enough points to win the Climb bib. In the women’s category, Astrid Øyre Slind’s third place was enough to crown her as the queen of the climb. In the sprint competition, Anton Karlsson did today what was necessary to win the green bib with his teammate in Lager 157 Ski Team, Britta Johansson Norgren, already winning the women’s competition. The Youth competition was more or less decided before the event, and both Torleif Syrstad, Team Koteng, and Sofie Elebro, Team Ragde Eiendom, sealed the deal in the race and won their respective categories.